On October 14, 2008, Professor Peter J. Parsons, Professor of Greek Emeritus, University of Oxford, was awarded the prestigious John D. Criticos Prize for his book, “City of the Sharp-Nosed-Fish-Greek Lives in Roman Egypt.” He received the award from Elizabeth Fotinelli-Criticos in a ceremony held by the London Hellenic Society and sponsored by the Criticos-Fotinelli Foundation. Professor Peter J. Parsons has spent most of his career at Christ Church, and later as University Lecturer in Papyrology. He was Regius Professor of Greek at Oxford from 1989 to 2003 and is a much-valued presence in the Oxford academic community. He has been editor and Director of the Oxyrhynchus Papyri, a long-running British Academy project for decades. In collaboration with Sir Hugh Lloyd-Jones, who preceded him in the Regius Chair, he edited the volume “Supplementum Hellenisticum” which transformed the study of three centuries of Greek Poetry. The scholarly achievement of Professor Peter. 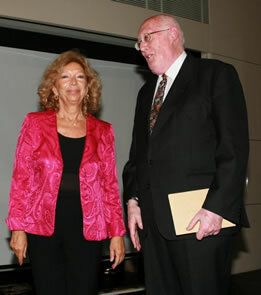 J. Parsons was celebrated in a conference “Culture in Pieces” on September 24, 2006.